Last, but far from least, we planted two bur oak trees this year, one of whom was planted during our memorial celebration of Amy Brt’s life, a community expression of gratitude for the impact one passionate young woman was able to have here- a vibrant life unfolding with in a fertile and supportive community. Her vision for community endures and continues to grow. It’ll be a long time before these oaks are mature, but that’s the nature of this whole project, isn’t it? Build for the future, find present joy in the vision of future children playing gratefully in the shade (and nourished by the food!) that we believed in way back now. Join us to grow the Food Forest by making your donation now! We had a banner year! Outside groups ran events, took tours, and volunteered countless hours. Resource donations soared this year too, enabling us to meet a variety of the goals set last winter for 2018, and off site presentations increased, too, ranging from Americorps volunteers and Community Learning Center leaders to farmers who grow nut trees. Ash Gordon from Nebraska Mushroom talks about the value of spent mushroom substrate blocks to garden soils. Union College, Leadership Lincoln, Nebraska Wesleyan, and UNL all made substantial progress on a variety of projects. 3 students from the School of Natural Resources course, Environmental Engagement in the Community, worked with us through the spring to develop signage priorities and mock ups. We expect installing signage to be a focus in 2019.
and as usual, the Statewide Arboretum and Nebraska Forest Service’s Community Forestry Programs remain stalwart allies. Throughout it all, week in and week out, we continue to receive hope and help from our uphill neighbors and friends at the Southern Heights Presbyterian Church. Our volunteers helped us build fencing along the top of the Crops plots and add signage clarifying the distinction of that space, built a compost sifter, and added intraguild pathways starting with the Pecan, Pawpaw, Chestnut, Children’s, and Walnut guilds. They also helped us add a stunning number of new plants: Thanks to Little Beaver nursery outside of Beatrice and a series of private donations, we added 500+ wildflower plants including pitcher sage, love grass, rigid goldenrod, rosinweed, bergamot, wild licorice, purple prairie clover, yarrow, prairie dropseed, daylilies, and false indigo. We also added quite a few sweet shrubs, a goji berry, our first blueberry, nearly a dozen grapes (thank you, Campbell’s Nursery), willow for a living tunnel (thank you, Lincoln Children’s Zoo), and will add Cornus mas in the next few weeks as a live staking experiment. We added rhubarb and wild ginger, hostas, cannas, and were gifted a locally grown variety of sweet potato dating to the 1930s that we can plant next spring. Last, but far from least, we planted two bur oak trees this year, one of whom was planted during our memorial celebration of Amy Brt’s life, a community expression of gratitude for the impact one passionate young woman was able to have here- a vibrant life unfolding with in a fertile and supportive community. Her vision for community endures and continues to grow. It’ll be a long time before these oaks are mature, but that’s the nature of this whole project, isn’t it? Build for the future, find present joy in the vision of future children playing gratefully in the shade (and nourished by the food!) that we believed in way back now. Join us to grow the Food Forest by making your donation now! Fall for trees! Fall for fun! Hundreds of families will be at the Enchanted Food Forest on October 28, and we need your help to make their experience a huge success. Everyone is welcome, even if you’ve never volunteered at the Food Forest before. You just need to enjoy having fun with kids! The event is 2-5pm. The sign up times include set up and clean up. Sign up for one shift, or the whole afternoon. Thanks for joining us. We are surrounded by such an amazing community: our thank you’s to you all! Thank you to each and every one of you who donated on Give to Lincoln Day. The collective impact for the city of Lincoln was outstanding. A special thanks to everyone who helped the Southern Heights Food Forest raise $14,214!!!! These funds make a tremendous difference in continuing to grow the forest. Check out the new video intro to the Food Forest: many thanks to LNKTV Health for filming this fun episode of Shape of the City at the Food Forest. 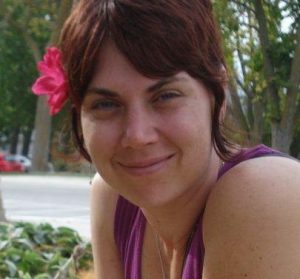 Meet Molly, our coordinator, learn some ways to make gardening easier and hear more about the progress in the Food Forest! 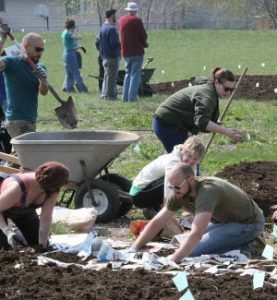 Located just north of Beatrice, Little Beaver Nursery donated hundreds of perennial plants to the Food Forest this spring. A wide variety of species are now in the ground and will be joining these existing pollinators in attracting insects soon. Thanks to Ross Brockley and the Hugelkultur Institute, a new Hugelkultur bed has been established at the southwest end of the project. Temporarily covered in daikon radishes and other fast growing plants to hold the soil, it will soon have a wide variety of plants. This simple technique creates create soil and retains rain water on the property, providing years of benefits. More information on Hugelkultur. Come, Meet New Friends, Make a Difference. We’ve got plenty of tasks for any abilities, including soil moving, weeding, fence building, sign making and much more, so come on out! Join us most Tuesday mornings at 7am in July and August for an informal gathering to talk about permaculture and food forests. No prior knowledge is necessary, just bring your breakfast and stop by! It’s a great chance to check out everything that’s been happening at the Food Forest. Event details here. 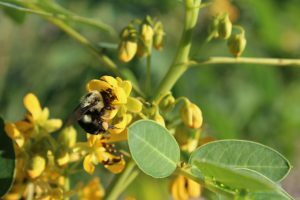 Give to Lincoln, Give to the Food Forest! Thanks to your help, the Southern Heights Food Forest is rapidly growing! 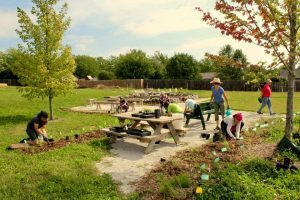 Trees have been planted, the outdoor classroom is active with young children playing and learning, and the community gardeners are cultivating their plots. 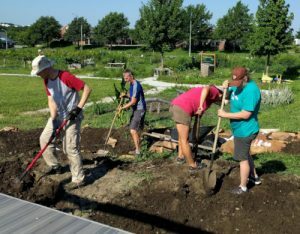 Now, you can continue the growing by donating as part of Give to Lincoln Day 2018: our forest garden needs ground cover plants and several new-to-you vegetables that come back year after year, including a host of popular indigenous food sources; and our outdoor classroom needs decking under certain areas, a new digging area, planter boxes, and culinary herbs for the kids to explore. We need signs that welcome visitors to our project, label key plants, and offer community guidelines for how this space should function. Our vision is to change the way we think about and value public space as a community. We are creating a space where entire communities and families are coming together to interact with each other and with nature. 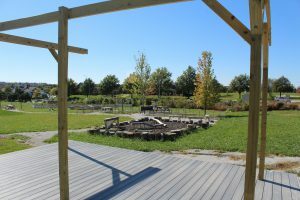 Unique in the nation, our food forest includes a space embedded within where children can play freely while learning about nature. We are teaching each other about food and ecology, all while forming multi-generational relationships and demonstrating for homeowners and park goers the amazing abundance available right here in south east Nebraska. Thank you for being a part of the Southern Heights Food Forest- we could not do this with out you! 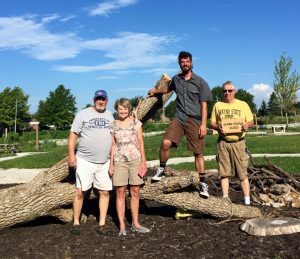 Join us for a fantastic workshop with Bob Hendrickson (Nebraska Statewide Arboretum), Ash Gordon (Nebraska Mushroom), Ross Brockley, (farmer and hugelkultur expert), Heather Norbert (Great Plains Biochar Initiative) and more! Learn how to improve soil fertility and water retention using techniques such as hugelkultur and mushroom blocks. 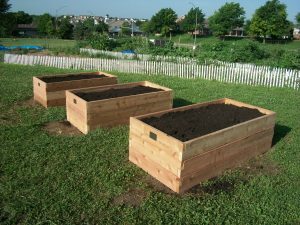 You’ll get hands-on experience creating raised beds by using decaying wood debris and other compostable biomass plant materials. Give to Lincoln DOUBLED! 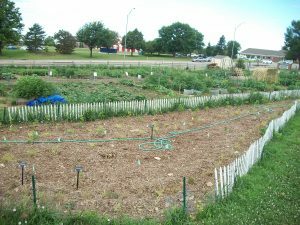 Southern Heights Food Forest is one of many organizations benefiting from Give to Lincoln Day. Give anytime in May and your donation will be doubled by our generous sponsors plus receive matching funds from Lincoln Community Foundation! What’s a Hugelkultur? 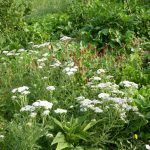 Hugelkultur beds are a great way to build your soil, but what are they? Read here for a great explanation. Spring is Here! How will you celebrate? We’ve got some ideas. 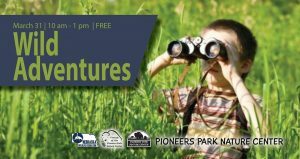 Bring your kids and stop by our table Saturday at Pioneers Park for some Wild Adventures! Tons of fun, free, nature activities for the whole family! Recycle Lincoln Celebration Or…stop by and see us at Auld, also Saturday, 11-1, and learn about local recycling options, including using cardboard in the garden. Details. Spring Garden Fun! Now is a great time to seed crops that love the cold (radishes, beets, spinach, lettuce, cilantro, kohlrabi, carrots, arugula, peas, and much more). Get the whole family involved as even radish “haters” will have to eat the ones they grew! Build a Birdbath Clay pot trays, an old sink, a bundt pan…all of these have been used to make bird baths. What can you recycle into a great bird watching spot for your yard? All ages are invited to visit the Nature Explore Classroom at the Southern Heights Food Forest, 40th & Old Cheney. Explore art, music, climbing, building, and gardening, plus make a kite and play lawn games! Sunday, May 6, 2-4pm – Families’ Guide to Using Outdoor Classrooms – come learn how you and your children of any age can explore nature in a structured way. Saturday, May 19, 10am-12pm – The Hills Are Alive! 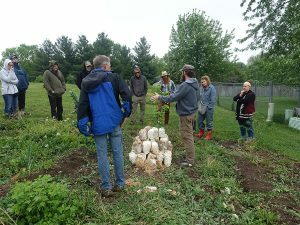 soil building workshop with Bob Hendrickson (Nebraska Statewide Arboretum), Ash Gordon (Nebraska Mushroom), Ross Brockley, (farmer and hugelkultur expert), and much more! 2017 has been wonderful! We’ve had delicious harvests, plenty of preschoolers, and volunteers galore. There’s much more to come next year: we’re asking for help to get 2018 launched. Good news: we are more than 1/3 of the way to our goal! AND: your help this month will be DOUBLED by a generous matching grant we’ve been offered. Several hundred preschoolers visited the Nature Explore Classroom this year, it’s first for full operations. 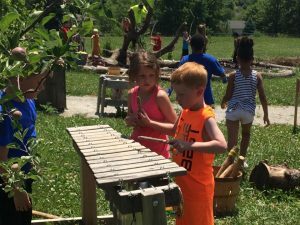 They sang garden songs, played with natural materials, and learned along the way. We had our first (small) harvests this year! Any kids who visited were treated to strawberries, raspberries, ground cherries, tomatoes, blackberries, and more, depending on the season. Thank you! So many of you came out this year! 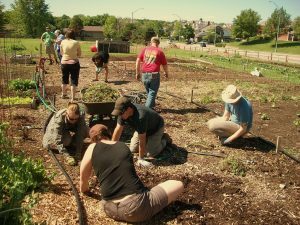 You volunteered, brought your kids, and told others about the Southern Heights Food Forest. To be a part of the community, we need everyone’s participation, so thank you! 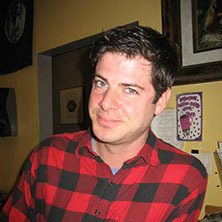 Help meet our match! 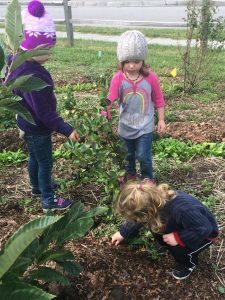 Two generous Food Forest donors have challenged you to donate this month. They will be matching your donations, doubling your impact! You’ll be getting more children out to explore and connect with nature. Please donate today! Your donations matter! 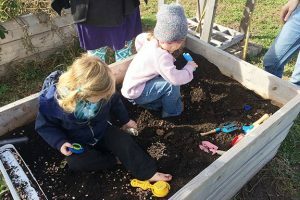 We’ve mapped a robust 2018 season, including training for parents and other community members about working with children outdoors, an adult education series, a sequence of soil improving cover crops and ground covering perennials, improvements to our rain water capture and infiltration, and new fruiting vines and shrubs. Please follow this link to give today. Please share this message (and your enthusiasm) with your friends. Thank you again: our slow, steady work together is creating a gift to the future that none of us could achieve alone. 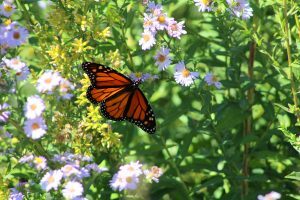 Events for Kids and Families: Nature Play: Story, song, and movement for 5 and under, with an accompanying adult. Kids Plant Strawberries: We have 40+ baby strawberry plants. We’ll give you a cheat sheet on what to do, and have prepped beds for you to plant in. Had you heard? There are homeschool kids starting to come play and learn. If you want to connect with them or find your own rhythm, please reply to this email. You can help us make this work: Volunteer Workdays: Come, at whatever speed works for you. We have apple trees to move, compost bin lids to build, paths to smooth, microswales to dig, cover crops to seed, fresh sheet mulch to install, and more. Outreach Events: We’ll have a booth at the Fall for Pride festival in Antelope Park. Can you help us staff it? We’ll need a few hands on deck for the strawberry planting and a few more for Trunk or Treat as well. Reply to this email to volunteer for those. Keep an eye out for other Upcoming Events: There will be a fall “get a good sleep” clean up day after hard frosts hit. There will be tours of the Food Forest coming up soon and more in the spring. There will be pruning and grafting workshops this winter and spring. With the recent certification of our Nature Explore Outdoor Classroom, we have come so far this year! The cold season is upon us and the Southern Heights Food Forest is focusing on going even further. Our sights are now set on building the food forest by filling it with sustainable plant material and we’ll need your help to change the landscape of Lincoln! 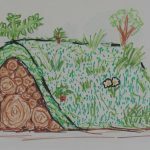 The food forest is a permaculture landscape design inspired by nature that creates an ecosystem through companion plantings of a wide variety of species. Hundreds of different plants will need to be placed in the ground for our vision to be realized. From large Bur Oaks to tiny White Clovers, these specimens will only find their home through support from you and our community. Our End of the Year Giving Campaign will give this project a needed boost towards completion. Any tax deductible contribution is appreciated and will provide one more step to bringing an inclusive ecological community to Lincoln. Since our design represents the different levels seen in a native forest, our donation categories will reflect Canopy, understory or groundcover plants. Donating at the tree level ($50) will expand our canopy layer, providing shade for those walking down our trails and keeping moisture in the ground. Donating at the understory (Berry Bush $20) level will fill out large patches of land providing abundant fruit in short order. Donating for groundcover (pollinator $10) plants will increase fertility and promote the next stage of succession reducing the presence of “weeds”. All donations will be pooled towards the next section of food forest to be completed, further fundraising and coordination of volunteers. This is a great way to show someone you understand their passions by donating on their behalf! Once you’ve donated we will follow up with you and send a card on your behalf to the person you’re donating for. Thank you so much for contributing to our shared vision and changing the landscape of Lincoln! To donate click on the link below. In part one and two, we shared how the Southern Heights Food Forest started with the seed of an idea and became a strong young sapling through community support and hands on volunteering. Now we bring you to April of 2016, when longtime volunteer, Adam Hintz, became our paid project coordinator taking this young sapling and giving it shape and strength to one day become a strong self-sustaining tree. 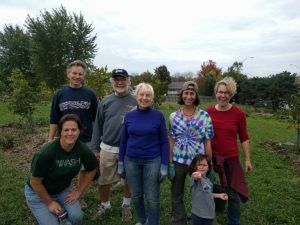 With Give to Lincoln Day quickly approaching, plans were set in place to organize a benefit concert to raise awareness of the food forest and accept money which would be matched from a donation pool from the Lincoln Community Foundation and its supporters. 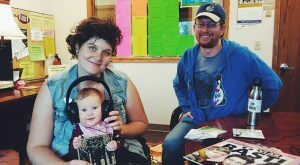 Local music veterans, Black Cohosh, who hadn’t performed in a couple of years, agreed to support the food forest and reunite for a special night of music at The Commons. The reunion show/fundraiser was a great collaborative effort between the SHFF, Black Cohosh, Bogusman (who opened the show) and The Commons. X-Rated: Women in Music, a radio show on local station KZUM helped promote the event. Even though Paul Simon was playing the same night in Lincoln, we had a great turn out, made lots of new friends and raised $400 to add to the $1000 raised on Give to Lincoln Day. Thanks to everyone who attended the concert and supported us on the day of giving! 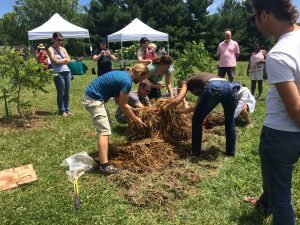 In early June, Community Crops held their Garden Gala at the food forest. 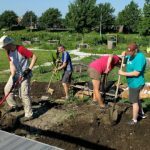 The couple of weeks leading up to the event brought us to the installation of the Southern Pollinator Garden, and a volunteer day to spruce up the area in general with a great turnout! The newly installed southern pollinator garden and the great turnout to prep for the gala. The Gala itself was a great celebration of community and gardening. 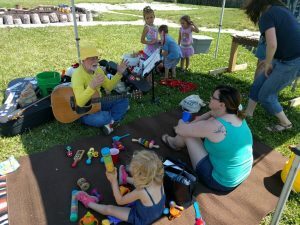 Lots of families and green thumbs attended for a tour of the site, to play in the outdoor classroom and enjoy ice cream donated by Ivanna Cone. Jim King fostering musical creativity at the Gala. Father’s Day weekend brought us a helping hand from Johnson Control who planted Hazelnuts, Serviceberries and Plums. The hard working volunteers got 4o plants in the ground in just over an hour. A true showing of hard work and dedication to our project! In July, a Boy Scout project gifted us with the construction of raised beds for our outdoor classroom. Boy Scout Alex handled all aspects of planning and implementation for these wonderful additions to our classroom. 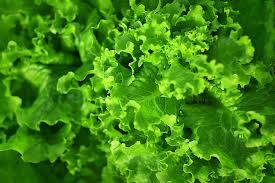 Now, children can have a garden to themselves and can learn about growing food first hand! A place for children to develop their gardening skills. Thanks Alex! 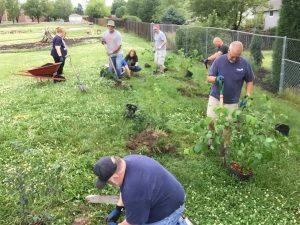 Later in July, Campbell’s Nursery and Julie Torquati donated Pear, Apple and Cherry trees to begin the orchard area connecting the food forest with the outdoor classroom. Because of their generous donations children will play and learn amongst the trees giving them inspiration and education of edible food systems. Adding to the outdoor classroom, our invaluable volunteer Neil Kolder, brought us a “tree of interest” from his acreage south of Lincoln. This tree is now the home of many creative climbers and fort builders and brought a recognizable established presence to the classroom. 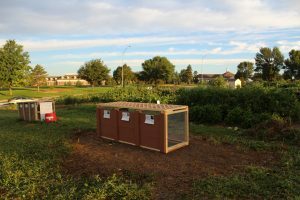 A new compost system designated for weed material only was built by another Boy Scout group in August. Thanks to Boy Scout Braeden’s leadership, we now have a place to put all of the plant material which would have just been thrown away! Braeden and his Boy Scout group preparing to construct the compost bin. Thanks to Mystic Rhodes Productions for connecting us! 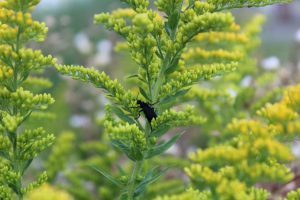 Throughout the whole year, the pollinator garden planted the year before brought color and critters to the space. Bees, Butterflies, Moths, Wasps and Beetles all found food and forage in this space which received little additional water. Our work was really paying off! In September we planted even more prairie plants for the outdoor classroom. These landscapes gave the areas more definition. The day of planting, Memorial Day Weekend was very well attended and we made fast work of the 200 plants installed. Lots of volunteers planting prairie plants in the outdoor classroom! 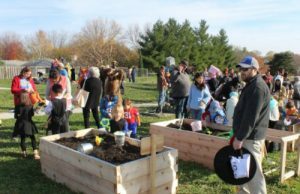 Coming up to the present we’ve just finished our first phase of our stage, are working on a storm water management system, installed a little free library and are preparing for another amazing Enchanted Food Forest Trunk or Treat on October 30th. Looking forward to a lot of great performances! 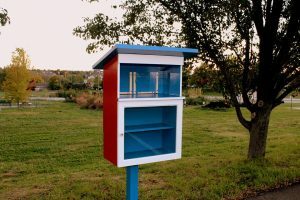 Our little free library ready to be filled with books!